Denver DUI Attorney & Car Accident Lawyer Whose Pet Is It Anyway? When it comes to divorce, there are two, main ways of separating property and assets. They get put into one of two categories: ‘shared’ and ‘marital’ property. Marital property is any property or assets that is clearly one spouse’s over the other. This would be any things or money that was acquired prior to the marriage. It may also be any gifts or inheritances that were clearly issued or given to one spouse, or any things or money that was agreed upon by both spouses, in a valid manner, to be one spouse’s over the other. Marital property, on the other hand, is a bit tricker. This is all property and assets that were shared and acquired over the course of the marriage. Colorado being a no-fault state can sometimes hurt the party filing for the divorce. For example, if a man is filing for a divorce because his wife had been cheating on him for many years, he often feels wronged in the process of property division because he feels entitled to more of the assets than his wife whom he may feel is responsible for the divorce. When it comes down to it though, everyone wants to know – what about the pets? Pets are considered property, and not children, to much dismay. So there will be no splitting holidays or weekends with Scruffy, unfortunately. There are a few outcomes when a couple cannot amicably decide on who gets to keep the pets. No one gets to keep the pets. In some cases, the judge will not want to get involved in the custody of a pet and will suggest that the couple find a new home for it entirely or give it away. This is never a fun suggestion to hear, no matter how new or close the pet is to the family. In other cases, the judge will begin to look at the pet as if they were a child seeking custody. They won’t suggest to swap back and forth with the animal or animals, but they will make a calculated decision on who would provide the best environment for the pet. 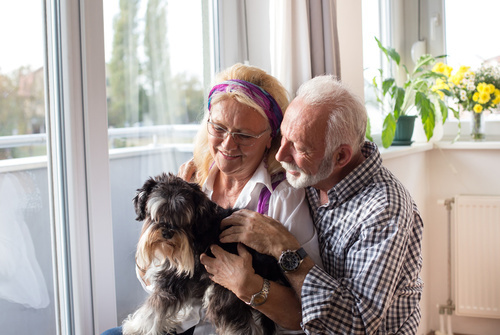 For example, if one spouse were going to need to significantly downsize their home and will ultimately have less indoor and/or outdoor space to provide for the animal, they may suggest the other spouse take the pet. Also, if one spouse travels a lot for work, they may find it in the best interest of the pet to live with the spouse that will be around more. Lastly, the judge will look at who has a stronger history with the pet. It’s not always easy to pinpoint who decided to get the pet, as it’s often a mutual decision between a couple, however if one spouse has a history of paying for all of the vet visits or grooming, then they may be found to have more leverage in why they should be able to keep the pet(s). If you are dealing with a divorce and need guidance on custody of pets, children or general help with separation of assets and property, contact us today to schedule an appointment with Jarrett J. Benson.